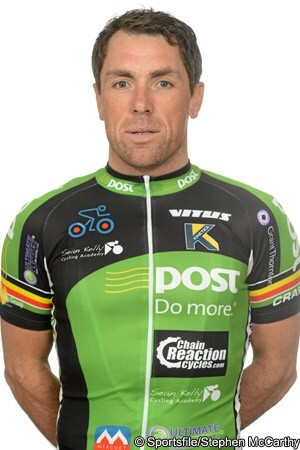 Having finally retired this year after 21 seasons as a professional, 42 year old Niko Eeckhout is taking up a management and coaching role with the An Post Chainreaction Sean Kelly team. The former Belgian champion moved to the team prior to the 2009 season and competed there for five years. The Belgium-based squad has confirmed that he will maintain his link with the team, remaining involved in another capacity. “He will have several roles,” team manager Kurt Bogaerts told VeloNation today. “Firstly, he will be doing some work in relation to the training of the riders. For those with coaches, they will continue to work with them, but Niko will have an overview of their training. That’s particularly important for new and young riders. Bogaerts said that the team also intends to have more coordinated group training during the season, with once-weekly sessions plus trips to the Ardennes and other places; Eeckhout will again be involved with that, and also with reconnaissance of race parcours with riders. He is currently with the squad at its December training camp in Calpe, Spain, helping guide the riders as they clock up the kilometres prior to the 2014 season. Bogaerts said that in addition to those roles, Eeckhout will also have other functions with the team. “Niko will do work as a directeur sportif. More and more often in the 2.1-ranked events, the UCI requires two directeurs. You can put two cars into those races, one behind the break and one behind the peloton. So he’ll work with me on that. Nicknamed Rambo because of his strength and blocky build, Eeckhout was one of the oldest riders in the bunch this year. Set to turn 43 this month, he is nearly a year older than Jens Voigt and Chris Horner. He took the Belgian road race championship plus the UCI’s Europe Tour rankings eight years ago. In addition to that, he clocked up a number of important wins during his career, including the Étoile de Bessèges, Grand Prix d'Isbergues, Dwars door Vlaanderen, Memorial Rik Van Steenbergenand, Schaal Sels and Driedaagse van West-Vlaanderen, plus stages in the Tour of Denmark and Ster Elektrotoer. He was a four time winner of the Championship of Flanders. His palmares and reputation ensure that he is a big name in Belgium and that plus Sean Kelly’s name will help in securing invites to races. “To maintain our good programme, Niko is in discussion with certain organisers,” said Bogaerts. The team has made clear in recent years that going to the Pro Continental level is a medium-term goal, but stated each time that expanding would have to depend on the correct budget being there. In addition, it is aware of its function in developing young riders and didn’t want to step up too soon. However Bogaerts now sees the time drawing close for the step up. “For 2014 we continue the way we are, as a Continental team with An Post and Chainreaction as the title sponsors. But the ambition is 100 per cent there to get a team higher up for 2015. Sean, Niko and myself are working hard on that, putting a lot of time in. “Our ambition is still to develop riders. That is something that we want to continue doing. In order to do that, the aim is to have two teams; a Continental setup and a Pro Continental team. We are talking to sponsors to try to get something started in 2015. Normally by May we should know where we stand. “It is not easy with the financial climate, of course, but I do think that things are going in the right way. There was a financial crisis but things seem to be improving in relation to that. We also have to recognise that there were problems in cycling and with its image. The main guy, Armstrong, admitted what he did and I think the sport needed to hear it. It had been a topic for a long time, with many talking about it. “If we are asked how we see the future of cycling, I think it is more positive than one year ago. Last year this [the Armstrong affair –ed.] was all happening and dominating the news, but things are more positive with sponsors now. “In addition to that, the biological passport started several years ago and I think it is now paying off. While we as a Continental team are not part of that system at this point in time, I think every person I have on the team is controlled by an anti-doping organisation, be it the Australian anti-doping agency, the New Zealand one, the British one, the Irish one, the Belgian one. 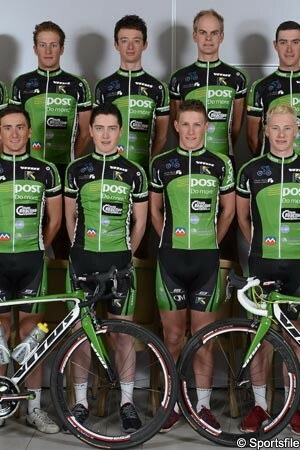 The team was registered as Belgian in recent seasons but Bogaerts said that the decision has been taken to change that to Irish for 2014. While it will stop the team from being able to ride Belgian kermesse races plus will cost it its Tour of Belgium place, he believes the benefits will outweigh the negatives. Due partly to Kelly’s involvement, the team has been punching above its weight for many seasons, in terms of invites. Bogaerts said that plus the riders’ aggression has helped the team earn important TV time as the bigger races have that kind of coverage, thus making it rewarding for the sponsors. He believes it has earned more exposure than other similarly-sized Continental teams, as has winning stages in races such as the Tour of Britain. Equally, the exposure has been greater than it might have been as the team has worked hard at social media. He believes this will all pay off when additional backers are sought for the Pro Continental step-up.